"The Importance of Being Funny"
Until now the Shaw Festival has never produced Oscar Wilde’s most famous play. 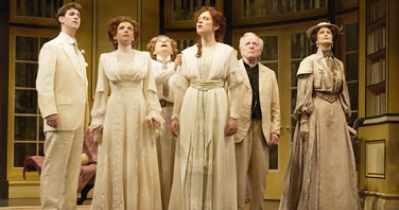 It has produced four other Wildes but never “The Importance of Being Earnest”. Directed by former Shaw Festival Artistic Director Christopher Newton in the jewel-box setting of the Royal George Theatre and with a cast attuned to so many other plays of the period, this “Earnest” would seem on spec to have credentials about as perfect as one could hope for in Canada. Yet, something has gone terribly wrong when more than half of its humour of this pinnacle of scintillating comedy has gone missing. Newton’s production gives the bizarre impression that the entire cast is having an off day. How could Newton, who made such hits of such obscure plays as St. John Hankin’s “The Return of the Prodigal”, fail to make one of the greatest comedies in English work on stage? The characters are lacklustre. Everyone’s timing is off, the rhythm of scene after scene is misjudged and the work has not been paced properly to build to a climax. Classic lines are thrown away one after the other, delivered so rapidly they don’t register or evoke mirth. My guess is that Newton has been tripped up by his own intelligence. He has decided to approach “Earnest” as if it were not the familiar play it is. After all, lines we now consider classic would not have been so at the work’s premiere in 1895. He seems to have taken the same approach to Wilde as he would to Shaw where so much of the difficulty is in making Shaw’s complex prose seem natural and his talking heads seem like real people. He is keen in creating personalities for Wilde’s characters. Gwendolen does seem like an uptight city girl, Cecily like a healthy lass brought up in the country. From Gwendolen’s brusque behaviour in Act 2, Newton makes clear that she will in time turn into her mother as has been predicted. People don’t naturally speak in Wildean epigrams, so Newton does not have them do so. The problem is that treating “Earnest” as a realistic comedy is like treating a Fabergé egg as a dairy product. The play is consciously artificial and the characters are no more realistic than the satirical types in the Gilbert and Sullivan operettas that so heavily influence the plot. The style Newton has cultivated in the actors simply doesn’t match the content. As Gwendolen says in Act 3, “In matters of grave importance, style, not sincerity, is the vital thing.” Later, Lady Bracknell says that we live “in an age of surfaces”. Wilde satirizes the superficiality of his contemporaries by making his characters as superficial as possible. Given this wrong-headed directorial approach, some actors fare better than others. Evan Buliung as an awkward but sincere Worthing and Fiona Byrne as a flighty Gwendolen with a core of steel are best able to make their characters seem realistic while still mining the full humour of phrase and situation that Wilde has provided. Close to their approach is Bernard Behrens as an amorous Reverend Chasuble. On the other hand, David Leyshon’s Algernon comes off more as a pompous twit than a cynical prankster and he seems to throw away more good lines any of the others. Goldie Semple’s Lady Bracknell is severe but hardly the frightening “gorgon” as she is described. Brigitte Robinson never seems prudish enough to bring out the full humour in Miss Prism. Diana Donnelly’s robust Cecily seems far too commonsensical to be the unbridled fantasist Wilde portrays. The abstraction of Judith Bowden’s sets suits the artificiality of the play, but following Newton’s lead, her costumes aim for prettiness and historical accuracy, even for Lady Bracknell, rather than the satirical exaggeration they invite. Similarly, Jeff Logue’s lighting confines itself to naturalistic effects. Those who have never seen the play before will probably still enjoy the Shaw production. Anyone, however, who has seen Robin Phillips’ famous Stratford production of 1975 (revived in 1976 and 1979) with William Hutt as Lady Bracknell or Derek Goldby’s 1990 CanStage production with Simon Bradbury and Brent Carver as Algernon and Jack, will know how riotous funny “Earnest” can be. As it is the Shaw’s production of Wilde’s “trivial comedy for serious people” is only fitfully amusing and a disappointing conclusion to its series Wilde’s plays. Photo: David Leyshon, Fiona Byrne, Wendy Thatcher, Diana Donnelly, Bernard Behrens and Goldie Semple. ©2004 David Cooper.